The American premiere of If Beale Street Could Talk – director Barry Jenkins’ follow-up to his Oscar-winning Moonlight – took place at the historic Apollo Theatre in the heart of Harlem. Introducing the screening, Jenkins made it known that, according to him, the movie’s first screening in the United States had to be in Harlem (the movie had its world premiere at the Toronto International Film Festival). Based on a book by James Baldwin, who was born in Harlem, it tells the story of two young lovers whose relationship is broken by the forces of American racism. Tish (Kiki Layne) discovers she is pregnant days after her boyfriend Fonny (Stephan James) is arrested for a crime he did not commit. The movie follows Tish as she tries to find a way to get Fonny out of prison, but is most interest in painting a rich picture of what life was like in seventies Harlem, and in the love that had to coexist with overwhelming pain and injustice. One couldn’t ask for better conditions to watch this movie, which is why I felt rather sad as I realized that, despite its many strengths, I couldn’t fully connect with the movie. If nothing else, one must admit that this movie is a technical feast. With Moonlight, Barry Jenkins showed incredible talent for pulling from numerous influences (from Asian art cinema to music videos) and creating a cocktail all of his own. This time around he digs even deeper using color (in costume and lighting), sound design, and a swelling score by Nicholas Britell not to recreate the world of Baldwin’s novel, but to represent it. This is a deeply subjective movie. The most telling recurring motive are shots of characters looking at each other (or straight at the camera). In its most effective moments, Beale Street is a movie about what the world looks like when you look at the person you love most. The most intimate scenes between the lovers are simply beautiful. It is curious, then, that such an aesthetically beautiful and emotionally open film failed to generate much of an emotional reaction. I am still not totally sure why the movie failed to connect with me (or maybe I failed to connect with it? 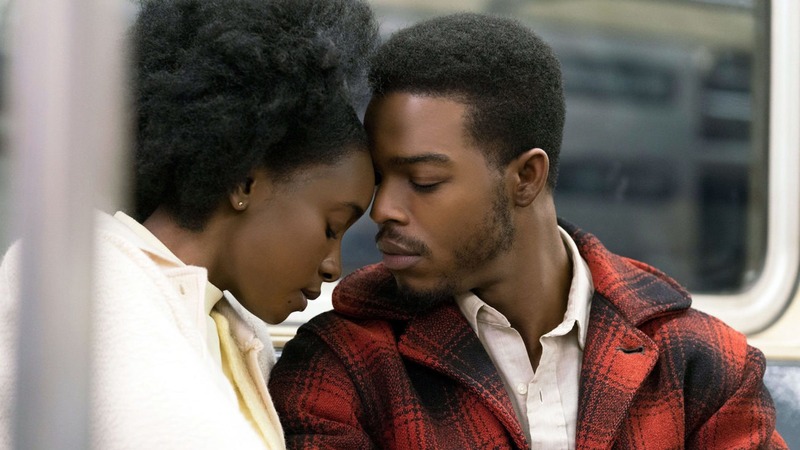 ), but one observation jumps out at me as indicative of my reaction: Almost every scene in If Beale Street Could Talk feels like it could be the most important scene of a different movie. Many of these scenes -like the one involving a recently released convict played by Brian Tyree Henry- are incredibly effective. But when these sort of scenes come one after another, they become harder to appreciate. Every scene contains words of wisdom, speeches, cathartic observations about the struggle of black live in America. It’s all valuable, often profound, but perhaps a little detached from human emotion. Going all-in on an operatic tone is, however, a daring gamble; one that I can see working for many viewers, even if it didn’t quite work for me. The latest movie by the Coen Brothers started its live not as a movie, but as a Netflix original series. It was only halfway through production that the brothers decided that the story they wanted to tell would work best as a stand alone feature. One can detect the project’s origins based on its structure as an anthology made up of six stories set in the old west, but watching the whole thing unfold makes it clear that the Coens made the right choice by consolidating these stories into a single package. The power of The Ballad of Buster Scruggs is not in any individual episode (although viewers are bound to have favorite and least favorite chapters), but in what the audience is left with once all the chapters have played out. As the movie moves from one chapter to another, what initially seems a comedic send-up of Western tropes emerges as a much darker and existential affair. Dark existentialism is a staple of the Coens work. What isn’t, is the political undercurrent that becomes clear once Buster Scruggs reaches its climax. If the common notion that every contemporary Western aims to diagnose the root of America’s soul, then the Coens have a very pessimistic outlook on the subject. 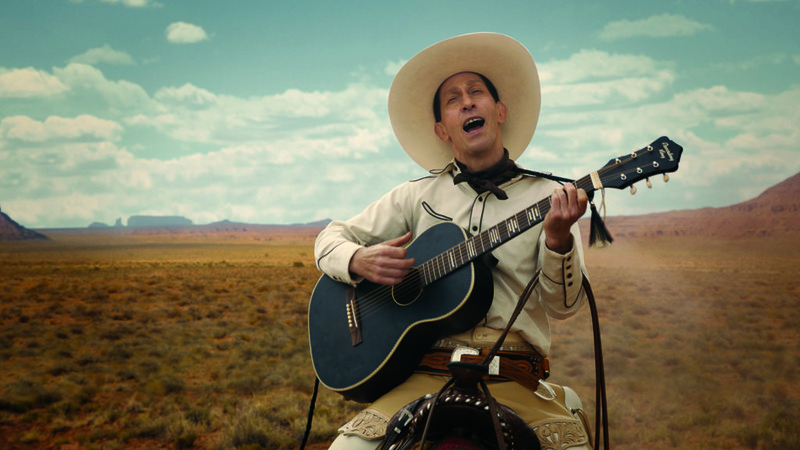 The first segment of the movie stars Tim Blake Nelson as the eponymous Buster Scruggs, a singing cowboy who might as well be a cartoon character. The man is introduced to us as a ridiculous crooner, but after a visit to a lonely saloon, it becomes apparent that Buster Scruggs is a killing machine. If it weren’t for the garish tone of the segment -which indulges in totally grotesque violence- we would consider Scruggs to be a complete maniac. He has more in common with Anton Chigurh (from No Country for Old Men) than any other character in the Coens’ history. As the segments go on, they become more realistic, ponderous, and sadder, presenting one tragic story of selfish, foolish self-actualization after another. The stand-outs are the fourth and fifth segments, which star Tom Waits and Zoe Kazan respectively. And at the end, we reverse to surrealism, for an ending that suggests that if America isn’t heading toward a truly terrifying place, it has already arrived there. Conrado Falco is a New York-based playwright who loves movies. He publishes most of his film writing at CocoHitsNY, but the best way to keep up with him is to follow him on Twitter (@CocoHitsNewYork).